EXTRA : Rag Blog Editor Dreyer Does it in Public this Friday! Poster art by James Retherford / The Rag Blog. 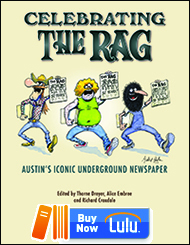 The banner, designed by famed comix artist Gilbert Shelton, is from the original Rag, Austin’s legendary underground newspaper published from 1966-1977. AUSTIN, Texas — In Austin? Or can you get here fast? 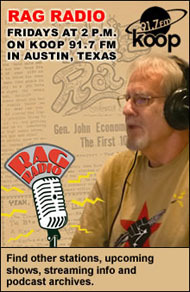 Rag Blog editor/Rag Radio host Thorne Dreyer is having another birthday, and he’s doing it in public! 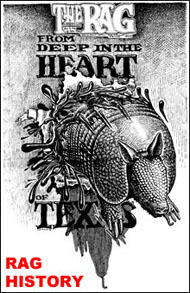 No gifts, but a small donation to the New Journalism Project — the Texas 501(c)3 nonprofit that publishes The Rag Blog — would be welcome. If you can’t come, here’s the link to donate. Don’t grow up! Come party with us Friday. This entry was posted in RagBlog and tagged Dreyer Birthday, New Journalism Project, Rag Radio, The Rag Blog, Thorne Dreyer. Bookmark the permalink. 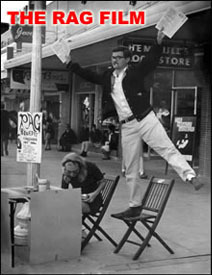 3 Responses to EXTRA : Rag Blog Editor Dreyer Does it in Public this Friday! Actually, I stopped growing older years ago — back when Jack Benny did. But I still have “birthdays” because I don’t want to make you old guys feel bad! is it my imagination, or do these posters look more like they should be hanging at the post office every year?? “the night-cap hooligan,” for sure!! !